Sarajevo draws visitors from all over the world as the largest urban center in Bosnia. With a strong cultural vibe, active arts programs, and historical monuments, Sarajevo is the heart of Bosnia and Herzegovina. If you’re looking to stay in Sarajevo, check out these hotels and make your search a bit easier. You can choose from specialty hotels, historic hotels, chain hotels, or even hostels if you prefer. If you’d like to stay in a quiet and comfortable hotel near the Bosnia River in Sarajevo. You’ll be in a location outside of the city center to take advantage of tranquil Bosnia-Herzegovina’s more suburban settings. Pay less and stay out of the bustle of the city at Roman Bridge Hotel. The Europa Hotel is one of the best located hotels in Sarajevo, so you can be sure you can take in all the sights that this city with European and Oriental influences alike. Look out your window in your hotel to see fabulous architecture detailing both the Ottoman period and Austro-Hungarian control. Is the most luxurious hotel in Bosnia and Herzegovina. It’s located just minutes away from Sarajevo International Airport. If you travel by bus or train, Grand Hotel is perfect for you. 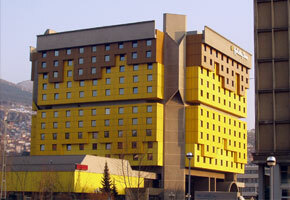 Hotel is situated not far from Sarajevo’s bus and train station, and also walking distance to downtown of Sarajevo City. This hotel was built in 1896. The Bosna Hotel is located in a lush park setting located about six miles from the very center of Sarajevo. The quiet setting is located in a suburban area with plenty to see and do. For comfort you’re acquainted with, stay at one of the Holiday Inn hotels. Visit the Land Museum, located conveniently across the street from the hotel. Take a day trip and drive 30 km to Mount Bjelasnica, or stay close to home and visit the nearby mosque, sports hall, the Old Town, and City Hall, all under 2 km. The Skend Hostel is located in the center of Sarajevo, near Skenderija Center. Walk to the old part of Sarajevo in 10 minutes and take in the sites along the Miljacka River. You’ll find comfortably furnished rooms for a reasonable price. The Relax House Hotel is centrally located near Bascarsija. This Turkish-style area in Sarajevo dates back to the 16th century, and was previously the site of the town’s busy marketplace. Walk down streets named after specific wares from the marketplace days, like Woolen Street and Gold Street. Take advantage of their larger sized rooms complete with a terrace and air conditioning. It’s a perfect family location for visitors to Sarajevo, but with hostel prices. The Banana City Hotel has 200 rooms available with a hostel environment for those who are looking for a fun, young atmosphere. Each room has a telephone, cable TV, bathroom, and mini bar, which sets it apart from the typical hostel experience. Travel to the city center on a tram or bus, and get to the airport easily, just 2 km away. Take the bus and train from the station, also located close by. If you are looking for a deal with easy access to transportation, the Banana City Hotel is for you.